In the Nord Department of Haiti lies Grande-Rivière-du-Nord, part of its Arrondissement that observed the 300th anniversary of its founding at St. Rose de Lima Church. The city is one of the few places in Haiti to possess a large population of people living to 100 years of age. No one knows exactly why, but future studies may give up some answers. A place of historical interest in Grande-Rivière-du-Nord is Gallifet Plantation where Haiti's slave revolt began, motivated by Voodoo rites. Many of Haiti's rulers have been born in Grande-Rivière-du-Nord, among them first ruler, Jean-Jacques Dessalines. It has also been the birthplace of Haiti's intelligentsia: Jean Price Mars, who pioneered the Negritude movement, inspiring the Black is Beautiful slogan of the 60s. Tiresias Simon Sam was born on May 15, 1835, in Grande-Riviere-du-Nord. Tiresias was born with leadership skills and had a lot of passion for his country. Before being a president he served as a general and then a minister of war under Florvil Hyppolite. He was chosen as the acting president after the death of Hyppolite and he was elected as the president of Haiti on March 31, 1896. Tiresias valued education and always choose educated people in his government. He was determined to make Haiti a better place and for sure Haiti developed greatly during his era. He increased jobs opportunities, improved transport, contracted U.S to build street car in Port -au-Prince and built a railway line to connect Cap Haitian to Grand Riviere du Nord and Port -au-Prince to Cul-de-Sac. Tiresias also built a civil court in Cap-Haitian and updated the school of science, Engineering and architecture. Grande-Rivière-du-Nord is located in Haiti's Nord Department. In the Grande-Rivière-du-Nord Arrondissement it is a municipality. It is located to the north of Port-au-Prince, the capital of Haiti at a distance of 120 kilometers. It is situated at an elevation of 92 meters above the level of the sea. On the Cormiers plantation in 1758, Jean-Jackques Dessalines was born here. 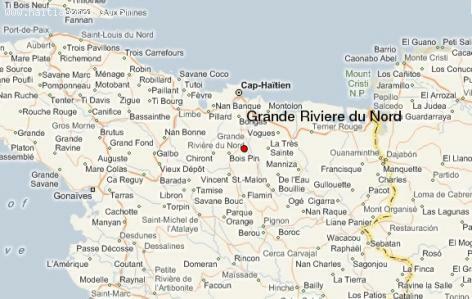 In the geographical coordinates, latitude 72° 11' 0" West of the Greenwich meridian and latitude 19° 35' 0" North of the equator, is located La Grande Riviere du Nord a river in Haiti. It flows relatively fast.